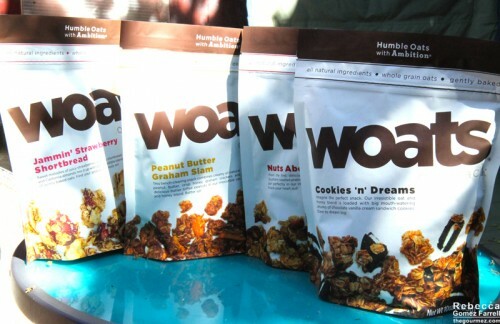 WOATS Oatsnack, widely available at a supermarket near you, came to be when its founder, Justin Anderson, discovered the ancient enmity between granola and braces. As each WOATS bag will tell you, young Justin set out to make a softer oat treat and succeeded wildly, starting his own company at the age of 16. WOATS has just launched their fourth flavor, Jammin’ Strawberry Shortbread, and I received it along with the whole WOATS product line to review (obligatory disclaimer! That means I didn’t pay for these WOATS treats). That’s a lot of oats! Luckily, oats and I go way back–I may even eat instant oatmeal uncooked with milk on occasion (often), so I was up to this task. My husband was up to the task of quickly inhaling whatever I left on the kitchen table. 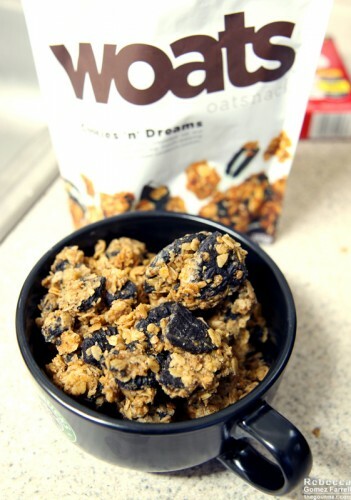 First off, WOATS is to granola as Fig Newtons are to granola bars. In other words, they are indeed soft, a little chewy, and extra sweet. That texture is very appealing! 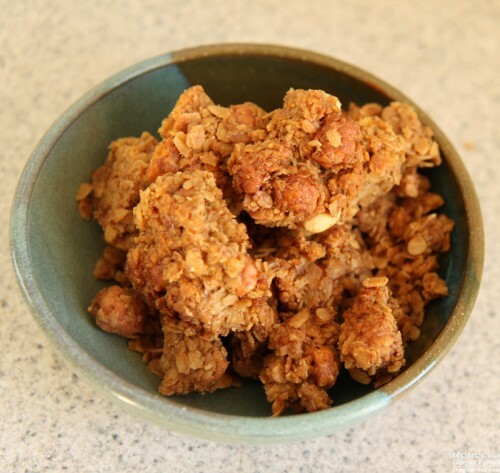 Additionally, each bag contains about a cereal bowl’s worth of food and offers a variety of sizes, from chunks nearly large enough to be a granola bar on their own to loose oats good for sprinkling over other foods or adding milk to and making a cereal of it (I may have done that. I may also recommend it.). I’ll start with the Jammin’ Strawberry Shortbread as it’s the first one I tried. I could not see many actual strawberries in with the oat and shortbread clumps, but the flavor of strawberry was impressive throughout. Its brown sugar sweetness was pleasing, and the shortbread chunks added enough indulgence to push the oatsnack clearly into the dessert realm. I love the dessert realm—I keep a vacation home there. Nuts About Berries was remarkably similar to the Jammin’ Strawberry Shortbread, meaning I also loved it. The nuts are praline pecans and the berries are tangy cranberries. It’s a nice combination, but I think the title would be better if it reflected those particulars. I expected a variety of nuts and berries and was a little disappointed I didn’t get them. Peanut Butter Graham Slam’s featured ingredients are butter-toffee peanuts, graham crackers, and peanut butter. Like most non-allergic Americans, I love peanut butter. But I’m not sure this was a good use of it, at least not after having tried the other brighter, fruitier products. 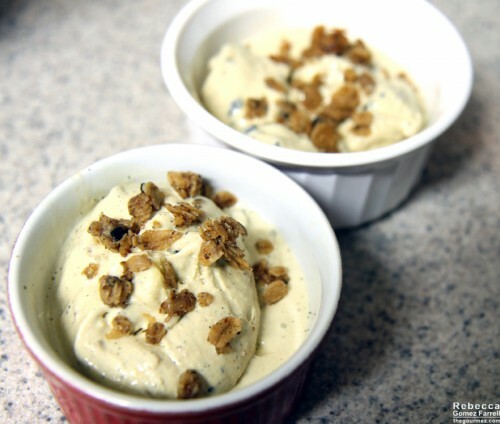 The toffee and peanut butter cancelled each other out in that they are both lush flavors that got lost in each other. I couldn’t taste any graham crackers, but I could really taste the buttery part of those peanuts, making it a rich offering—too rich for me to eat more than a chunk at a time. Now that I think about it, that’s probably a good thing. 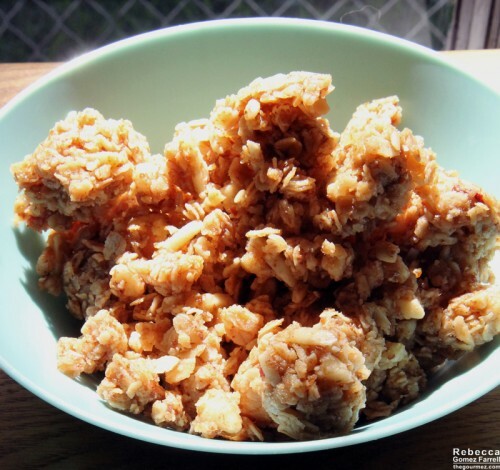 All the WOATS come in at 120 calories per 1/4 cup, so munching lightly is wise. I saved Cookies ‘n’ Dreams for last, because I was eyeing them to use for ice cream, something I realized WOATS would be great for from my first crumble of Jammin’ Strawberry Shortbread. Out of the package, mighty chunks of your basic Oreo cookie knock-off rise high, and the accompanying vanilla and chocolate made their presence known, making for a great sweet treat. But….ice cream! I made a vanilla bean- and cardamom-infused custard base. About five minutes before churning was complete, I added a half a cup of chopped WOATS. The result? A lovely smorgasbord of warming flavors in a cup of cold ice cream! That’s a pic of the soft-serve version right out of the ice cream maker. The WOATS were an easy way to add texture and flavor into the mix. Give it a try! In summary, I’d eat WOATS any day. My favorite of the bunch was definitely the Slammin’ Strawberry Shortbread for its concentrated strawberry appeal and the well-integrated shortbread complement to the chewy oats. Add me to the fans of WOATS! Are you one already? Reviewed the week of 5 March 2015. WOATS are quite a good add-on for ice cream. I may make that again sometime soon.